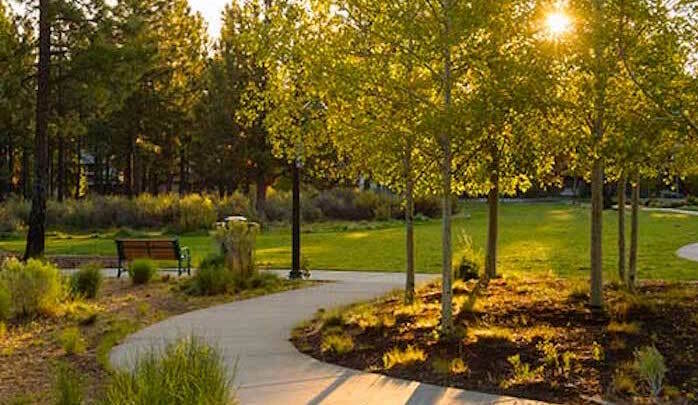 You won’t find many McMansions around Bend, but if you’d like to explore some of the nicer residential areas of the city on your run, there’s no better choice than Northwest Crossing (affectionately shortened to NWX) which was built on a Ponderosa Tree Farm. The tree-lined sidewalks of Northwest Crossing Drive end in a large loop, which encircles the family friendly Compass Park. For a look at Bend’s impressive environmentally friendly contemporary cottages, follow the streets which form concentric circles out from Compass Park. When you reach the outer limits, the linear path of Sunset Park will carry you back towards the start.